I didn’t have much time to do the garden thing while in Texas – having a Grandmother spunky enough to turn 88 kept me very busy for 4 days. There were endless family drop-byes, brunches, lunches, dinners, afternoon naps, stories told, and advice given. There was even a six year old with a head full of velcro rollers under a hairdryer! Very Texas. I did take a walk down a street I know very well – a street I must have driven up and down thousands of time in my life, but have never walked. So while everyone else was cooling their heels under the ceiling fans, I pulled on my vans and wandered over to Honeysuckle Lane. 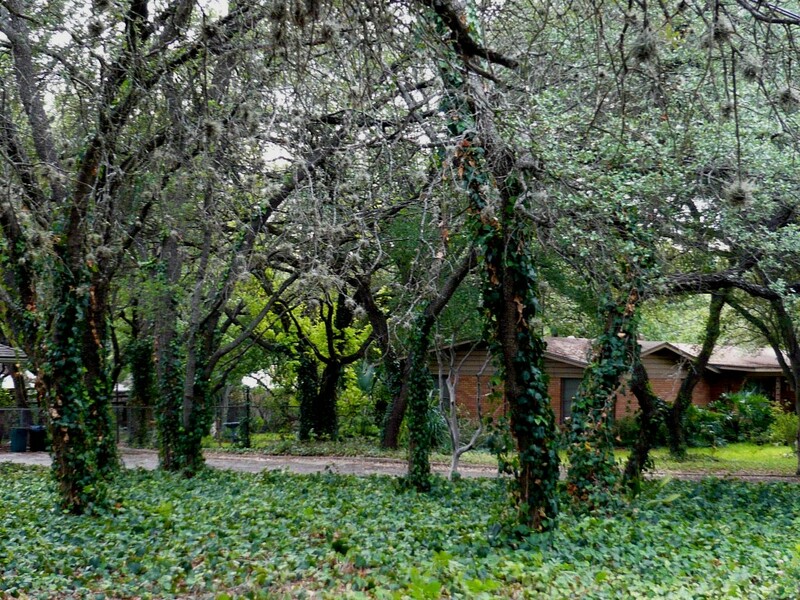 I’ve always loved this primeval front yard forest – the moss in the branches and the ivy-covered trunks are so evocative – spoooooky! There is something about South Texas and trees. Oaks are everywhere, with beautifully shaped branches twisting, bending; reaching for the sky in an almost heartbreaking way. But even other trees – camphor trees, carrotwoods – they ALL look better than they do here in Los Angeles. Arborists are obviously well thought of in Texas. It was a nice day – hot, but overcast, so it wasn’t torture. There was even a breeze every now and then. I saw a soft green shrubby perennial swaying in the wind – and it had the most remarkable pointed red flower buds. Could it be? I walked closer. Yes. 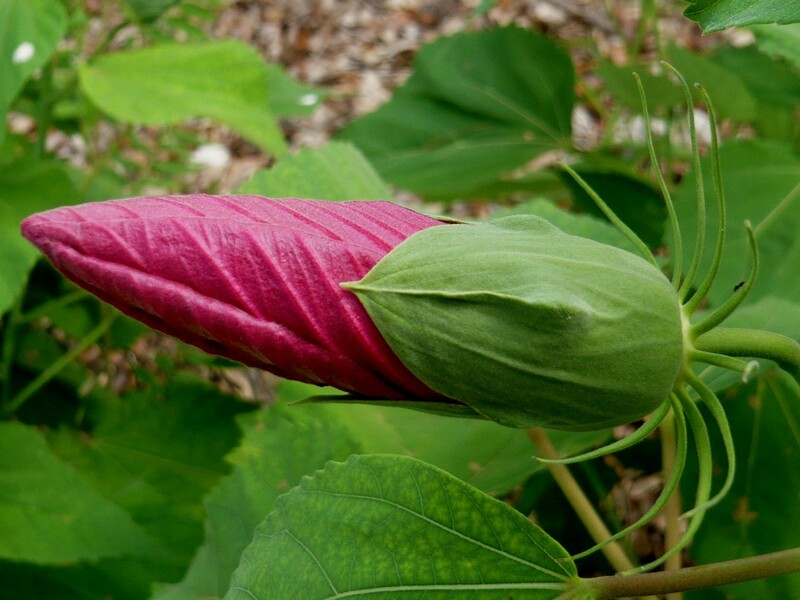 It was – the unmistakable lipstick-tube buds of Hibiscus moscheutos, or Rose Mallow. There were no open flowers, which might have been just as well because I know I’d have screamed. They are as big as serving platters! And even though I AM given to hyperbole, I am being totally straight here – the flowers are THAT big, and THAT gorgeous. But the bud was beautiful enough – I was happy to see it! A black truck drove by and almost hit me. My fault – I was staring at a beautiful sweep of lantana, realizing that I was actually staring at a BEAUTIFUL sweep of LANTANA! Huh? Even though I promised myself years ago to stop having plant prejudices (there are no bad plants, only bad PLANTERS) I’m still not too keen on lantana… but check it out here! See, this just proves my previous parenthetical point. Earlier in the day I’d noticed a drought tolerant garden I wanted to take a peek at. As I approached, I was welcomed by a beautiful opuntia, underplanted with hesperaloe parviflora, and a Pride of Barbados was preening in the background. Wow. I was immediately jealous. I REALLY need more garden space! How am I going to find room for all of the BIG plants I want? Because I seem to always want the biggest plants; plants that tower and soar and intimidate and dominate. 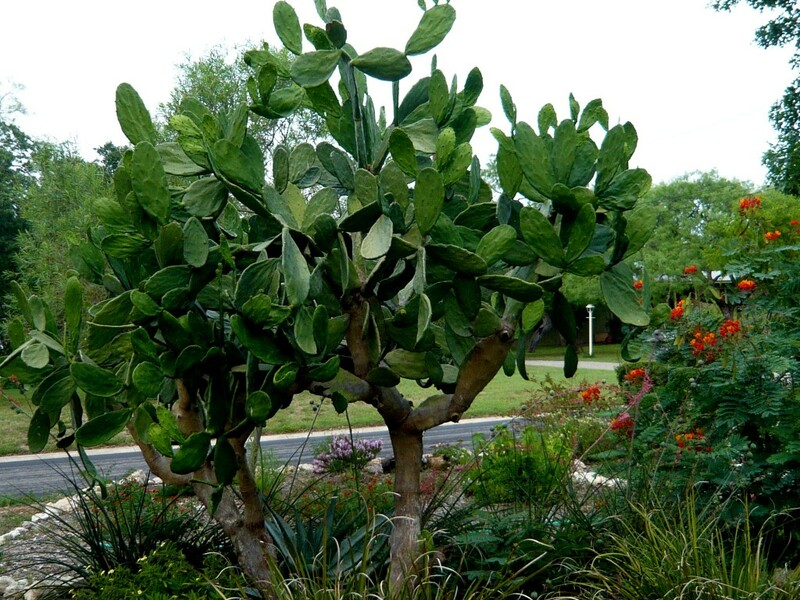 Well – I have no more garden space (okay, actually, I have a little more…) but I’m going to find a way to get a big opuntia like this anyway. As I snapped a few photos of this island of sensible planting in a sea of lawns, my phone rang. I was being called back to the family … more Grandma-palooza was underway (my magical little sister Christina came up with the very appropriate title to the weekend’s events). So I had to cut my garden reprieve short and mosey on back up the road to the ole homestead. 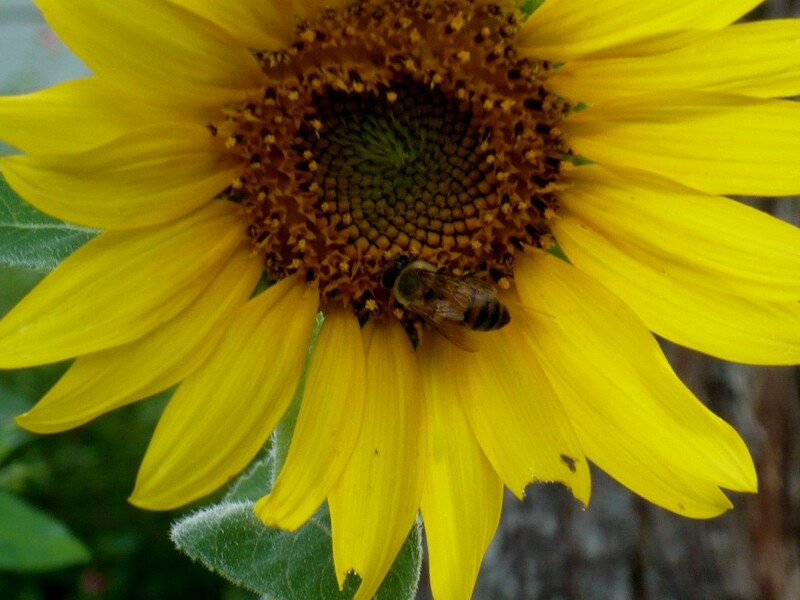 But before I did, a friendly sunflower waved goodbye, and in the process, attracted a vigorous pollinator. Bye-bye flower. Bye-bye bee. Have yourselves a good time. I’ll give you some privacy! I’m drooling and wishing that I lived in Texas. I’d love to see the Hibiscus when they are opened. The buds are a gorgeous colour. The field of Lantana is amazing. You must have had a good time at Grandma-palooza. Wish I could grow Opuntia here. It’s important sometimes to slow down and smell the ros… er, flowers. I love a garden walk… and I drive my daughter nuts when I peer into people’s back yards to spy on their kitchen gardens. Thanks for taking us along on your garden walk. Is that what lantana is supposed to look like? It’s so lush! Our Los Angeles lantana always looks brittle and prickly. Who knew? And that Rose Mallow pic would look fabulous in a frame above my vanity table! That IS a cool opuntia tree. I wish you’d had time for an Austin visit, Germi. You were so close! Hi KateSmudges (I LOVE your name!) – thanks for stoping by! 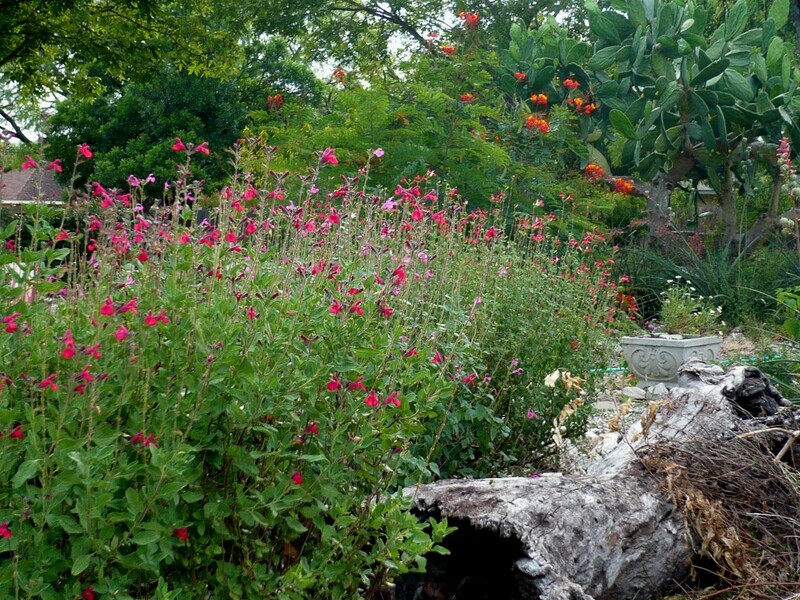 Yes, I have to admit to also being jealous of Texan gardeners – they seem to be able to grow everything! BUT – your garden is so perfect for your style of artwork! However, I would love to see how you’d smudge that field of lantana! Daniel! Cityslipper! Hi! Thank YOU for coming on the garden walk with me! I have to say, the back yard was a wonder – but nobody was home and, although I’ll snoop over the fence(we are alike in that way), I’d feel odd taking pics of the private area! Starlily, check your email inbox! Hi there Pam! Sigh! Will I EVER make it to AUSTIN??? The coolest garden city in the country cannot continue to elude me! My garden’s too small for big plants, mostly, but I can see why you want that sculptural opuntia in your life. Could it really live in your climate? Nutty! I like the red salvias (?) blooming in a mass above the bleached-white tree carcass. The spooky lichen trees, I agree, scary! Sounds like a full weekend of grandma-centered fun. What a great garden walk. It is beautiful!! I know how large hibiscus can get! Wow, that forest on the lawn is amazing…spooky too. I love lantanas, it was the first plant I ever owned, and it bloomed in my college dorm window all the (bleak) Canadian winter so I have a soft spot. Plus I’ve seen how the butterfies love them, so more points to them. We are so lucky to vicariously experience the gardens of other climates so easily now, by way of our garden blogger friends. Thanks, Germinatrix. Always enjoy going on walks with you! 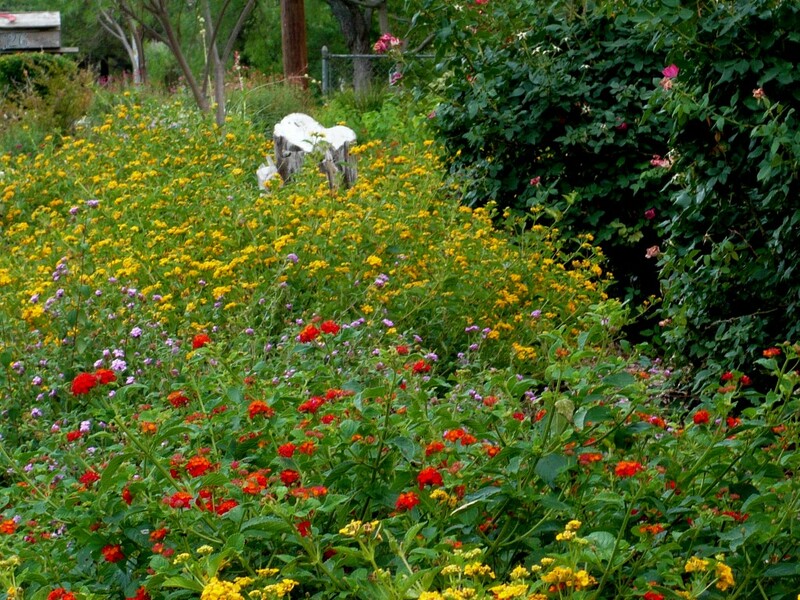 The first time I read that someone recommended purposely PLANTING lantana, I nearly fainted. In my part of South Mississippi, lantana is a weed. I kept a trusty little hatchet with which I used to chop it away from the front steps of my rental cottage at the beach. In less than a month (more like 10 days), it once again would be blocking the entrance. Looks lovely in your photo but not outside the front door and 5 times taller than my dog (may he rest in peace). Woohooo! Ah chan fael tha Texahs heat emanatin’ frahm thase photas! Tha dhamp faertile atmasphear! What a nice walk, thank you for taking us along! It’s so hard isn’t it when you are with family and you want to be with them because you traveled to be with them but you also want to get out and about and see things!? Hate that part of it. LOVE the hibiscus. Would you look at the size of that Opuntia! I wonder how old that is? We planted one in the ESP when we first moved in to the house some eight years ago. It has grown a lot (about 5ft) and I keep trying to trim it upward. Seeing your picture, I think I should be a little more aggressive with this “up-pruning” (now why did the cactus man just spring into my mind)! I will have an opuntia “tree” one day. I am with you on the lantana front. We had to remove so much of it when we first moved in, it was everywhere. I could not look at it again for years. I have now succumbed to three creeping lantanas which I like better for one of my “hot spots”. They do a pretty good job of filling in an area. They still get worried though, everytime I pause and look at them, clippers in hand. Sounds like your Grandma-palooza was a great success. Next time you HAVE to pop North into Austin. The N. tribe blew tiny reed darts at me all afternoon from deep inside my oriental grasses after learning you would not be visiting, and bearing gift “offerings”…it was so annoying! Hello Karen! I MUST have the opuntia – and it CAN live here … even though I haven’t seen this exact variety, I think LA and opuntias are like peas and carrots. (Does that make ANY sense?) I also loved that red saliva – it looked to me like the variety ‘Hot Lips’ that was mostly reverted … but beautiful! I liked that the gardener of that front yard created little vignettes that didn’t seem precious at all – a really hard thing to do! Thanks for stopping by … I’m adding you to my blogroll – you have a great site! Hi Darla – Those flowers open and close in one day, like daylilies, and are so breathtaking! They are perfectly flat circles. Super dramatic! They just kill me! I had one when I started gardening, but it was ultimately just too wet for my dry garden. Boo. It can just live in my dream garden! Hey Expat! (Jean to all you who are looking at the name on her comment – she’ll always be Expat to me!) Lantana is a controversial plant! I think, in addition to its crazy vigor, my main objection is the smell. It just rubs my fur backwards. I can’t believe you had to use a hatchet to control your lantana! And my warmest thoughts are with your dog – we know they ALL go to heaven! Eoh mai, Tindrel – yew shuda bin theyer! It wuz jist goarjuss! Ah luuuvv Tixus! Loree, even though being with the family was so great, I needed this little bit of time to keep my SANITY! Just a few minutes was all it took – and spotting that opuntia really helped! Getting a little bit of plant love under my belt gave me my second wind. It WAS a great walk! XO! ESP, my pal! I must admit that I decided to take the Honeysuckle Lane stroll because as I was driving earlier that day, I saw that opuntia with the Pride of Barbados next to it, and of COURSE it reminded me of your garden! I was so blown away by the shape of the ‘Opuntia Tree’, and laughed out loud when I saw that the little rubbery spines DO look like little penguins! Can Cactus Man withstand the aggressive up-pruning? He HAs been looking a bit wan – but I am a fan of Cactus Man! I’m rooting for him! Oh, I am SO SORRY the Nanananabooboos made you suffer for the snafu that kept me from fulfilling my diplomatic duties! I will have to not only come bearing the gifts due them, I should also perform a ceremonial dance in their honor. I will go far to assure a peaceful visit to The Patch! If you can grow an opuntia like that, I think you really have to. I don’t think it’d ever grow like that in Portland. Sigh. I thought of you peering over fences yesterday when I came across a garden with two tetrapanax with the biggest leaves I’ve ever seen. I went so far as walking up their steps, but I really wanted to move in for a close up. I love ending up somewhere with potential for good garden watching walks, even if there’s not enough time to fully explore.